from Shouwang Church on Saturday, March 23, 2019. (Beijing—March 26, 2019) Beijing authorities shut down one of the most prominent unregistered churches in their jurisdiction on Saturday and questioned dozens of its Christians on Saturday, following the closing of another widely-attended church in the area. Shouwang Church, which is an influential Beijing church, was accused of refusing to register with the government as a “social organization” and subsequently closed on March 23. All of its subsidiary organizations were also closed, and the church’s possessions were confiscated. On the day of the closure, Christians attending Bible classes affiliated with the church had planned to meet at 1:00 p.m., but authorities took them to a nearby school and interrogated them, recorded information from their ID cards, and informed them that the church had been shut down. 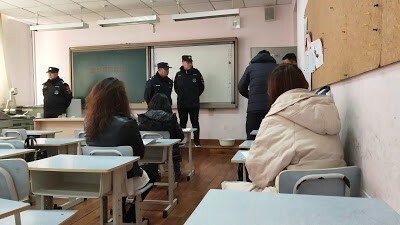 Many officers monitored the Christians inside the classroom. On the sidewalk outside, some Christians stood and observed the proceedings. Despite the allegations, Shouwang Church had submitted an application to the Haidian District Ethnic and Religious Affairs Bureau in 2006, but the officials rejected it on the grounds that its pastor, Jin Tianming, had not been officially ordained by the state. In China, clergy who do not receive their credentials from the government are not allowed to serve in churches, but many still serve in the unregistered churches. Jin has just been placed under house arrest. 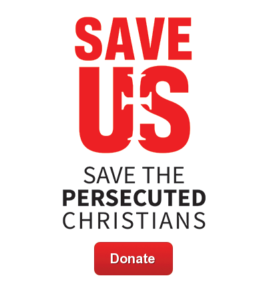 The church has faced many hardships since its founding in the 1990s by Jin and his wife, including the confiscation of their multi-million dollar property and church members being placed under house arrest. Because of the pressure, some of the church’s attendees opted to flee China or give in to the government’s demands. Over the past few years, the church has met in outdoor locations, such as parks, even in inclement weather. This crackdown comes just months after Chinese authorities forcibly shut down another unregistered Beijing church, Zion Church. Such closures come in the wake of the Chinese government implementing a revised edition of its Regulations on Religious Affairs on Feb. 1, 2018, narrowing the margin in which unregistered churches previously thrived. The new regulations coincide with China’s attempts to force religion to align to its ideals, a tactic known as “Sinicization.” As a result, many churches have faced persecution.